Sweat is dripping from the ceiling, and there’s nowhere for it to fall except on the sea of bodies packed shoulder to shoulder at the Tramshed in Cardiff. Everyone is saturated, and it’s all Idles’ fault. The Bristol post-punks sold out the venue in under an hour when tickets went on sale back in November, and it seems the audience’s enthusiasm hasn’t waned since then. As everyone awaits the band, and many make last minute beer runs, the air is electric and smiles are plastered on every face. The crowd is a motley crew, but as Idles and their AF Gang online community say: “All is love.” Despite bumping bellies and breasts with many a stranger while attempting to secure a good viewpoint, there were only helping hands and chuckles at everyone’s uncomfortable physical proximity. No elbows were thrown. It couldn’t be further removed from the scene only a few hours earlier in the venue’s empty beer garden, where the band stood for the third edition of Gareth Jarvis’s wet plate portrait series, which resurrects a process that dates back over 150 years. As the venue manager’s greyhound-staffy cross looked on nervously, the band held their positions in the unexpected sunshine. It’s probably the longest they’ll stand still on their current sold out tour, which will see them play three consecutive nights at the Electric Ballroom in Camden, London before heading to Europe and the US. Ensuring they squeezed in tight, arms were wrapped around each other and hands held without a second thought. It’s the kind of familiarity that only comes with truly being comfortable in another person’s company. As you can see from the portrait, Idles most definitely are. ​After compliments on sunglasses were swapped, and exclamations over the unusual photographic process exchanged, it was time to start moving again. Each member went their own way prior to the show, some eager to get to the music shop before it shut and others looking forward to catching up with family. Just like the one attempt we had to capture this photo, Idles ensure they make the most of these stolen moments in between soundcheck and set time. Taking to the stage later that night, the band were far removed from the relaxed fellows who stood in front of the lens. Guitarists Mark Bowen and Lee Kiernan took turns diving into the crowd, while frontman Joe Talbot showed off some impressive moves from his dance repertoire—I’ve never seen anyone do the running man for that long. As for an astoundingly accurate high kick, let’s just say it landed a couple of inches short of Kiernan’s face. The setlist started with Colossus, the opener from their recent LP ‘Joy As An Act Of Resistance’, and continued through the album’s tracklist to include Never Fight A Man With A Perm and I’m Scum before dipping into their debut album, ‘Brutalism’, for crowd favourite Well Done. From then on it ping-ponged between the two releases, as well as calling on their ‘Meat’ EP for a rendition of Queens. We were also treated to an a cappella burst of Mariah Carey’s All I Want For Christmas Is You and a quick chorus of Bon Jovi’s Living On A Prayer, because of course we were, alongside some words of wisdom from Talbot. Idles have enjoyed a whirlwind couple of years since dropping their debut. They’ve toured the world, selling out shows in the US, Australia, Europe and UK in the process. They appeared on Later... with Jools Holland, supported Foo Fighters at London's O2 Arena, and saw their second LP reach number five in the UK charts. The Cardiff date on their tour in 2016 took them to Four Bars, a small 100 cap room above an Irish pub, to open for Pile. Now they’re dominating venues 10 times that size, and it’s clear Idles are able to rise to any occasion. In doing so, they lift everyone up with them. Fans support and participate in the band’s message of inclusivity , and up-and-coming acts are taken on the road and along for the ride — though it’s worth noting that the quintet were recently called out on social media for the lack of diversity of support acts on the tour. Head here to see more from Gareth Jarvis. 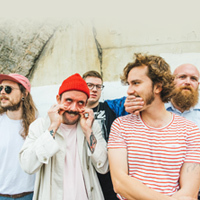 Click here to compare & buy Idles Tickets at Stereoboard.com. Idles, You Me At Six, Nick Mulvey and Enter Shikari are among the acts set to play intimate London shows as part of War Child's Brits Week. Idles have lined up an outdoor Irish show for next summer. Idles have added another London date to their spring UK and Ireland tour.